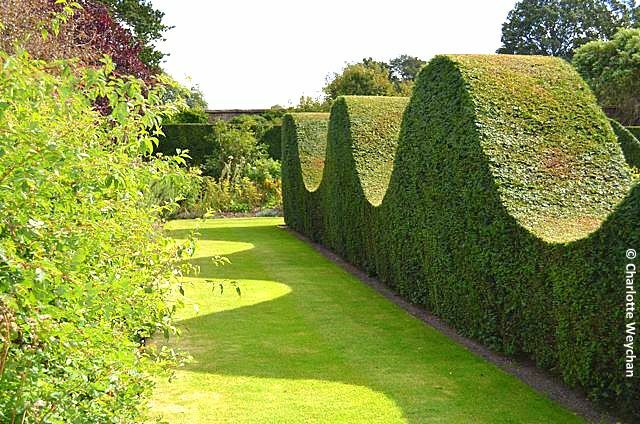 Houghton Hall, Norfolk - where flaming fountains and serpentine hedges abound! 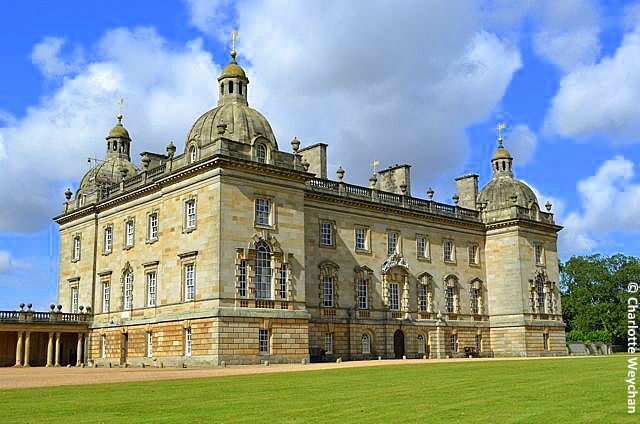 Houghton Hall in Norfolk is regarded as one of the finest Palladian houses in Britain. It also holds some surprises for garden visitors because the current Marquis of Cholmondeley has turned the five-acre walled garden into a showpiece that thrills visitors throughout the summer season. 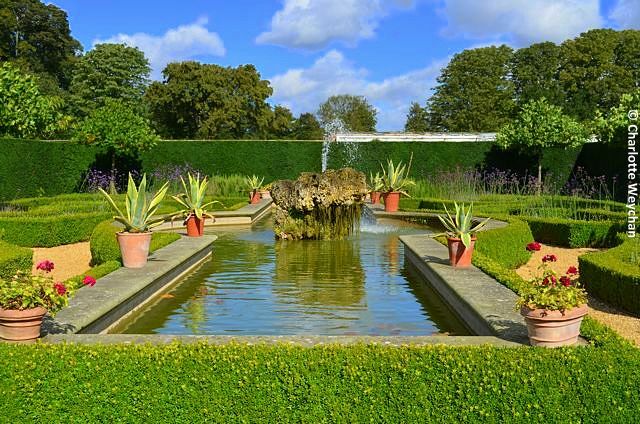 It features miles of immaculately-clipped serpentine hedging and a fountain that flames - no mean feat for a man who found gardening "boring" when he first arrived here in 1989! 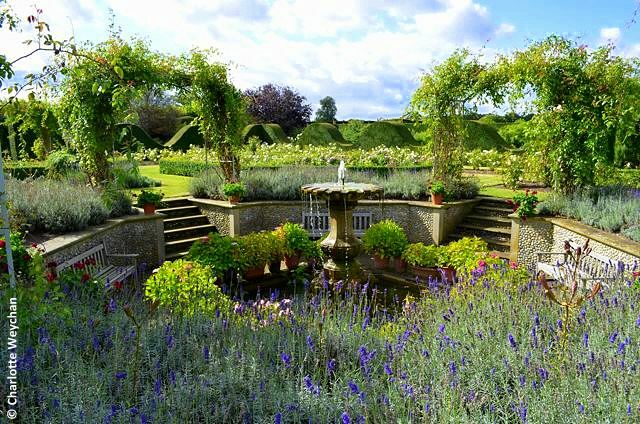 Although he was no stranger to gardening because he grew up at Cholmondeley Castle in Cheshire, where his mother has created another impressive landscape. The house has a long history and was built for the current Marquess' ancestor Sir Robert Walpole - Britain's first prime minister - and was also home to his grandmother, Sybil, who was a prominent society hostess. He grew up at Cholmondeley Castle in Cheshire, where his mother created another remarkable garden that opens to the public, so when he arrived at Houghton, plans were drawn up with the help of his head gardener, Paul Underwood (who has now moved on to Blickling Hall), to redesign the dilapidated walled garden. Julian and Isabel Bannerman (who created the Collector Earl's Garden at Arundel Castle and the water garden at Woolbeding House) were called in to help with the structural redesign in 2003, and their style is very much apparent in some of the more theatrical elements of the garden, like the rustic temple adorned with antlers (above) and the grotto fountain where water spills from giant clam shells. The garden has continued to evolve over the last decade and there's a potager, a formal rose parterre, a croquet lawn - open to guests - a Mediterranean garden, Italian garden and laburnum garden. 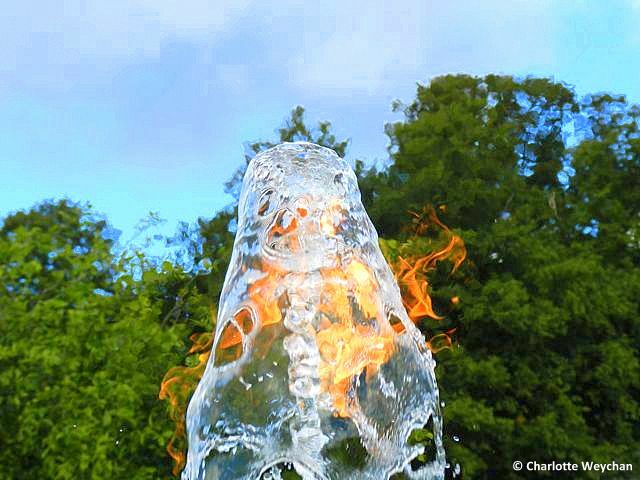 The 7th Marquess has also invested in a collection of modern art, including the remarkable Water Flame (above) by Jeppe Hain - a fountain that actually flames! There's a lot to see in the five acres, divided into several themed areas, using dense yew hedging to give protection against the Norfolk winds. 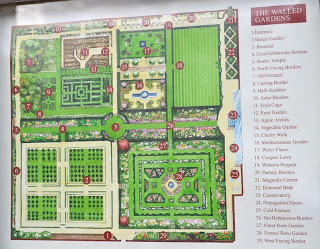 A plan at the entrance (left) illustrates how the garden has been divided into four quarters of equal proportions, with a strong central axis, running north to south, featuring flower borders - with "hot" colours at one end and "cold" at the other. 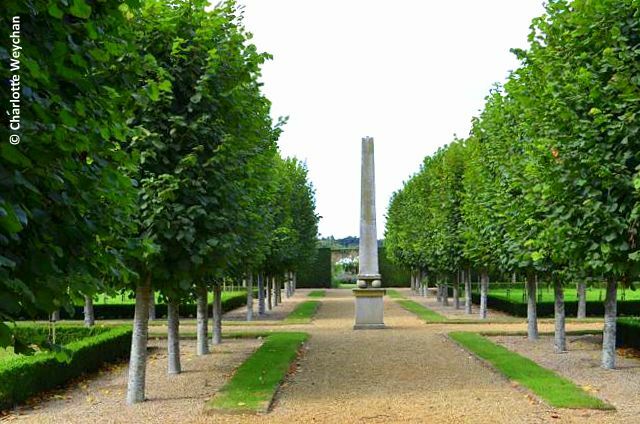 At the entrance you have the Italian garden, featuring rows of pleached limes and a large obelisk. Behind this is the kitchen garden, which includes espaliered fruit, a potager, a traditional orchard and a herb garden. Each quarter of the garden stands as a separate entity and you wander between them, returning to the central flower border axis to get your bearings, before moving on to another area. 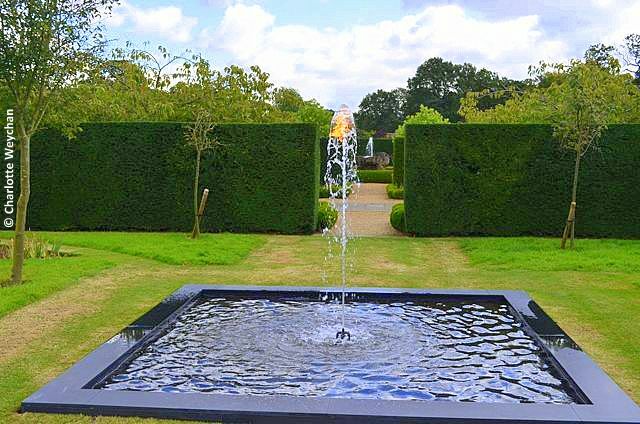 The third quarter includes the Mediterranean garden with a large central pond and fountain surrounded by a box parterre (above), which is opposite the startlingly simple Laburnum garden (below), where the Water Flame is the eye catching centrepiece. This quarter also houses the croquet lawn, where guests are invited to play if they feel like it. 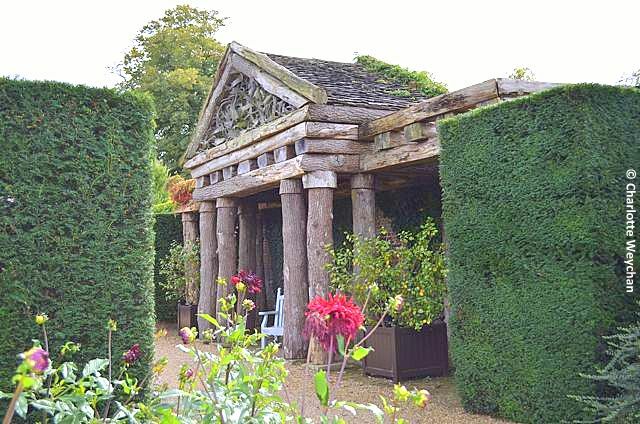 The fourth quarter of the walled garden houses the magnificent Rose garden with its arbors and sunken fountain area, against a backdrop of undulating and immaculately-clipped serpentine yew hedging, reminiscent of a giant Loch Ness monster. The design here is taken from the ceiling of the White Drawing Room in the main house. The roses are a combination of old-fashioned shrub varieties, modern, repeat flowering species and ramblers - all carefully selected to give a good display throughout the season. Add to this the colourful borders and the restored glasshouses, where you'll find lemon trees and exotic orchids growing, and there's a lot to look at within the walls of the former kitchen garden. The Hall is also open, but not in the mornings, and there are six other major artworks in the grounds adjacent to the Hall, including a Cornish slate circle by Richard Long. But you cannot access the house or inner gardens until 13.30. Elsewhere in the 450 acres of grounds you will see hundreds of deer - memorable because they are white - and a church used by both residents of the hall and those who live on the estate. Houghton Hall is open from April until the end of September, on Wednesdays, Thursdays, Sundays and Bank Holiday Mondays - 11.30-17.00. Admission to the garden is £7.00 for adults and £2.50 for children (free to HHA members). The house is also open to the public, but not until 13.30. Located in the same part of Norfolk as the Queen's Christmas retreat at Sandringham House and Pensthorpe, (where the Millennium Garden was designed by Piet Oudolf) you've got a glut of exceptional gardens to visit locally! What a wonderful garden. I love the rustic temple, the flaming fountain and the rose garden. A gem of a garden with beautiful water features! The flame fountain is stunning, set amongst beautiful gardens.